A state's number of electors equals the number of representatives plus two electors for both senators the state has in the United States Congress. The number of representatives is based on the respective populations, determined every 10 years by the United States Census. Based on the 2010 census, each representative represented on average 711,000 persons. ^ McCarthy, Devin. 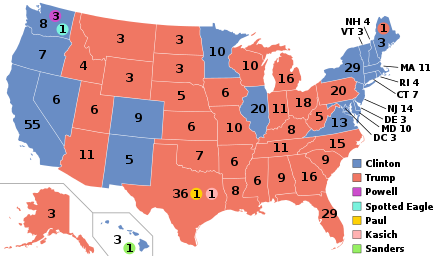 "How the Electoral College Became Winner-Take-All". Fairvote. Retrieved November 22, 2014. ^ "Electoral College Instructions to State Officials" (PDF). National Archives and Records Administration. Retrieved January 22, 2014. ^ "Apportionment of the U.S. House of Representatives Based on the 2010 Census" (PDF). Washington, D.C.: U.S. Census Bureau. December 21, 2010. Archived from the original (PDF) on January 24, 2011. Retrieved December 21, 2010. Each state's number of electoral votes is equal to its total congressional representation (its number of Representatives plus its two Senators). ^ "Election 101" (PDF). Princeton Press. Princeton University Press. Retrieved November 22, 2014. ^ Black, Eric (October 14, 2012). "Our Electoral College system is weird – and not in a good way". MinnPost. Retrieved November 22, 2014. ^ "Legislative Action?, The NewsHour with Jim Lehrer, November 30, 2000". Pbs.org. Archived from the original on January 24, 2001. Retrieved August 26, 2010. ^ "Election Reform" (PDF). Dos.state.pa.us. Archived from the original (PDF) on May 1, 2008. Retrieved August 26, 2010. ^ Skelley, Geoffrey (November 20, 2014). "What Goes Around Comes Around?". Sabato's Crystal Ball. Retrieved November 22, 2014. ^ Egan, Paul (November 21, 2014). "Michigan split its electoral votes in 1892 election". Lansing State Journal. Retrieved November 22, 2014. ^ Gray, Kathleen (November 14, 2014). "Bill to change Michigan's electoral vote gets hearing". Detroit Free Press. Retrieved November 22, 2014. ^ Wilson, Reid (December 17, 2012). "The GOP's Electoral College Scheme". National Journal. Archived from the original on January 8, 2013. Retrieved November 22, 2014. ^ Bugh, Gary E. (2016). "Representation in Congressional Efforts to Amend the Presidential Election System". In Bugh, Gary (ed.). Electoral College Reform: Challenges and Possibilities. Routledge. pp. 5–18. ISBN 978-1-317-14527-1. ^ Hernandez, Carlos Felipe. 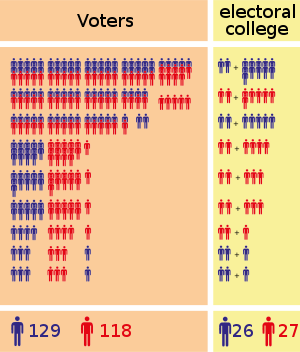 "National Popular Vote – Electoral college reform by direct election of the President". 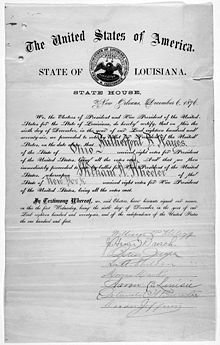 archive.nationalpopularvote.com. Retrieved September 14, 2016. ^ Koza, John; et al. (2006). "Every Vote Equal: A State-Based Plan for Electing the President by National Popular Vote" (PDF). p. xvii. Archived from the original (PDF) on November 13, 2006. ^ a b Amar, Akhil; Amar, Vikram (September 9, 2004). "The Electoral College Votes Against Equality". Los Angeles Times. Archived from the original on April 15, 2010. ^ "Guam Legislature Moves General Election Presidential Vote to the September Primary". Ballot-Access.org. July 10, 2008. Retrieved July 24, 2014. ^ "In Guam, 'Non-Binding Straw Poll' Gives Obama A Commanding Win". NPR. November 12, 2012. Retrieved July 24, 2014. ^ a b c d "The electoral college badly distorts the vote. And it's going to get worse". Washington Post. Retrieved November 17, 2016. ^ "Letters". The New York Times. March 15, 1979. Retrieved August 18, 2017.